Approximately 2.5 percent of children under age three are allergic to milk, making it one of the most common allergies in children. It is most common in infants who are fed formula from cow’s milk than in those who are breastfed or give hypoallergenic hydrolyzed formula. Although the allergy is usually related to cow’s milk, milk from sheep, goats, and other animals are not safe alternatives since the milk proteins are very similar. Most children who are allergic to milk developed the allergy during the first year of life. Thankfully, most will outgrow the allergy by age three. Blood test – A blood test, also referred to as an IgE test, measures your immune system’s response to the proteins found in milk by counting the number of specific antibodies in your blood. Elimination diet – The offending food is eliminated from the diet and then added back in to see if it causes an allergic reaction. *It’s important to differentiate between a milk allergy and milk or lactose intolerance since the cause, symptoms and treatment are different. Milk or lactose intolerance occurs in people who are missing the enzyme lactase, which breaks down lactase, a sugar found in milk. Without this enzyme, these individuals are unable to digest milk and dairy products and thus experience digestive problems, like gas or diarrhea. 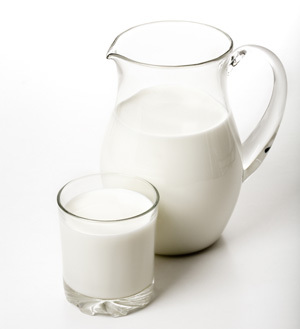 A milk allergy involves an immune system reaction triggered by two types of proteins present in milk, casein and whey. A person may be allergic to only one or both casein and whey. Eating Out: When dining out, ask detailed questions about ingredients and how the food was prepared – your health and safety are at stake! There’s a high risk for cross-contamination in the kitchen so be sure to clearly express your food allergy to the server or cook. Ask if your food was prepared with butter, dipped or mixed with milk, etc. Request to look at the food package or recipe if necessary. A new diagnosis can be scary. Be sure to build a support system of family, friends and healthcare professionals to help you manage your milk allergy. Talk to a doctor or registered dietitian when eliminating foods from your diet about possible nutrient deficiencies like protein, calcium, vitamin D and vitamin B12. They may recommend an adjustment in your meal plan or a supplement to replace nutrients lost by eliminating the offending food and food ingredients. Also talk to your doctor about how to prepare for a reaction. You may treat a mild reaction with oral antihistamines to reduce signs and symptoms and relieve discomfort. If you are at risk for severe reactions or anaphylaxis, your doctor may advise you to wear a medical alert bracelet and/or prescribe an injectable epinephrine (EpiPen) to carry with you at all times.